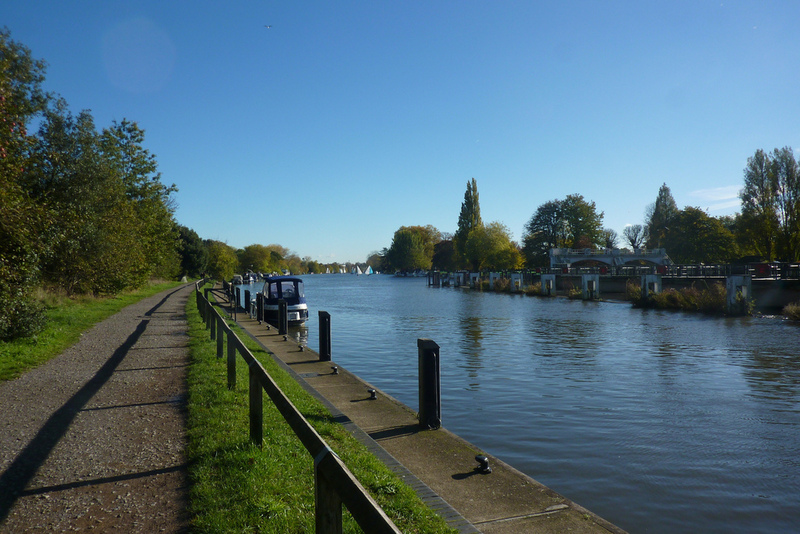 When we first thought about walking the Thames Path, we believed we’d have the whole thing done in a year. A 184 mile walk, going at around 10 miles a day? Eighteen days of walking. Maybe a bit quicker if we had some good days. No problem. True, we had no idea how we’d do the section from Oxford to the source, which sits in a public transport wasteland, but we’d tackle that problem when we got to it. 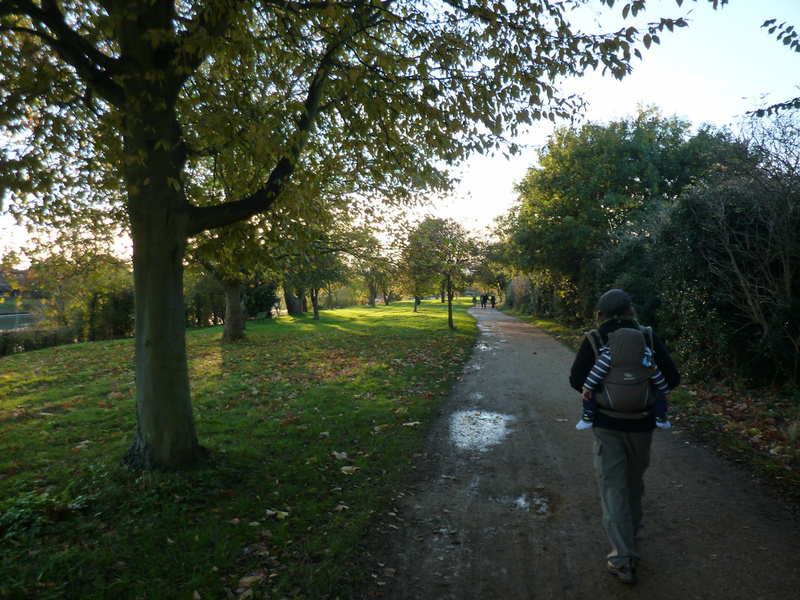 At that point, the extent of our experiences of walking with a baby in tow consisted of an hour or two strolling round our local park, or pottering around the myriad of paths that network nearby Wimbledon Common. It didn’t take us long – one day of walking in fact – to realise how hopelessly optimistic we’d been. Walking with a baby is slow. There’s the nappy changes and the regular demands for food. And, for some reason unknown to anyone, they’re not that keen on spending the entire day in a buggy or baby carrier. They like to get out, wriggle around, stretch and play. Now it must be said that Sam never minded going out on walks. From a very early age he loved to look at everything. And I mean EVERYTHING. We’d take him out and his head would spin from side to side, as if afraid he’d miss something extremely important. He’d be happy and content to be able to stare intently at a bush, a wall or a bird in the sky. We’d leave the house and there’d be an excited wobble as he waved his arms in the air in excitement, eagerly anticipating the new wonders he would see. Even as he got older and more active – able to crawl and then pull himself up to stand on his feet – he was still happy to go in the baby carrier and head out for an adventure. Just as long as the adventure contained plenty of time for him to wriggle around in a chair or on the floor. After two days of walking the Thames Path, it had become abundantly clear that there was no chance at all of getting all the way to the source within twelve months. The goal swiftly changed to something far less ambitious. To do a mere 36 miles from the Thames Barrier to the boundary between Greater London and Surrey. So just two weeks shy of Sam’s first birthday we made our way on an ancient, smelly and decrepit rail replacement bus, back to Teddington with one aim. To walk the mere five miles to that boundary at Hampton Court. To say it was a good day to get some fresh air was, perhaps, an understatement. The previous night I’d been celebrating a friend’s birthday, and it was only at 2am, after much beer had been imbibed, that I’d made it to bed. I had a headache (initially attributed to alcohol related dehydration, but which turned out to last for three days thanks to a head cold), and was feeling queasy due the rather strange smell of fumes inside the bus. There was nothing for it. I needed a good blast of cool reviving air mixed with the healing powers of the sun’s rays to sort me out. There’s something about autumn sun. It hangs low in the sky, dazzling brightly. So bright was it, that the Thames looked almost white in parts; the light reflecting off the rippled surface of the water. “What’s the name of those boat things?” I asked Catherine, pointing to many small boats with sails that were sweeping gracefully over the water. I was having a memory problem. I kept wanting to call them yachts but perhaps they were just dinghies. They might have had some über complicated name, or they could just have been called “sailboats”. I simply couldn’t remember, and I was in fear that if I called them the wrong thing, someone would come up to me and correct me. There wasn’t much help in correctly identifying the vessels; Catherine said something but it was lost on the wind. Or I’d gone deaf. I couldn’t be sure. Whatever they were, there were lots of them, apparently in some sort of race. Each one would circle around gracefully on the water. Periodically, a large mechanical buzzer would occasionally sound, presumably a timing marker or to call in boat 42 as “you’re time is up” although nothing seemed to change on the water. 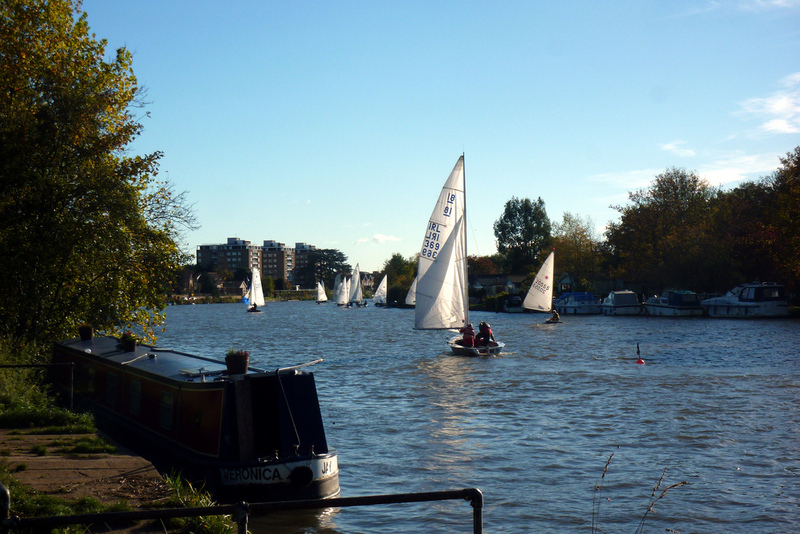 The boats still circled; their blue and white sails billowing in the wind. We meandered on, squelching along the muddy tow path, preferring it to the rather busier tarmac path on an embankment above, until the two joined up with a narrow road just opposite a rather substantial tree. This was the site of Half Mile Tree, an earlier elm tree that had sat at this location for over five hundred years. Nothing lasts forever though, and towards the end of its life the tree was so hollow inside that local folklore said that a man could stand upright within the trunk. 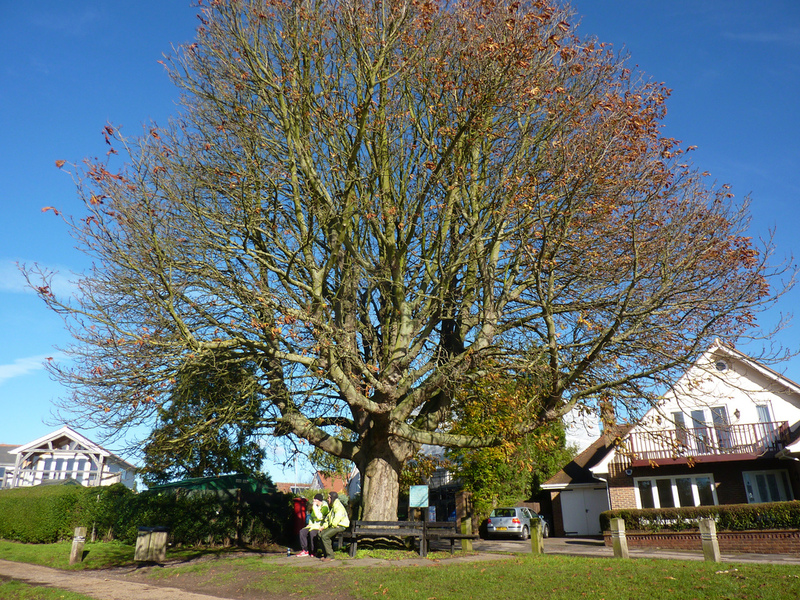 The hollow section was apparently filled in with concrete in a seemingly vain attempt to beat its decay, but by 1951 the authorities finally admitted defeat and the tree was removed. Its replacement – the current and rather sizeable chestnut tree – was planted the following year. All of this we learned from reading a rather battered and worn interpretation board near the tree itself which was conveniently positioned in such a way that in order to read it, you had to stand on the other side with your back to the tree you were trying to learn about. Well why would you want to actually look at the tree? Anyway, the reason for the name of Half Mile Tree was also given on the board which told us that the tree was approximately half a mile away from Kingston town centre. It barely seemed like we’d been walking for ten minutes but suddenly, there it was. Kingston. Or “Royal Kingston” as the local council’s signs preferred to proclaim, due to it being one of six Royal Boroughs. The coronation place of a number of kings in the tenth century, the right to use the term “Royal Borough” was finally conferred to Kingston in 1927 by George V, and the town’s been living off it ever since. Besides its royal connections – flashed up on signs as frequently as possible – my only knowledge of Kingston was that there was a pasty shop, a Wetherspoons and a branch of the Job Centre which I’d been forced to visit fortnightly a few years earlier. Despite the fact I lived a mere two miles away from a different job centre, the all powerful mandarins of the Job Centre had decided my postcode didn’t fit. This required me to take an hour long bus ride in order to claim my Job Seekers Allowance. Ironically my bus journey also took me past two long-closed branches of the Job Centre; their fading signs still visible on the side of boarded up buildings. Those visits to Kingston were always rather depressing. And they didn’t go near the river once. 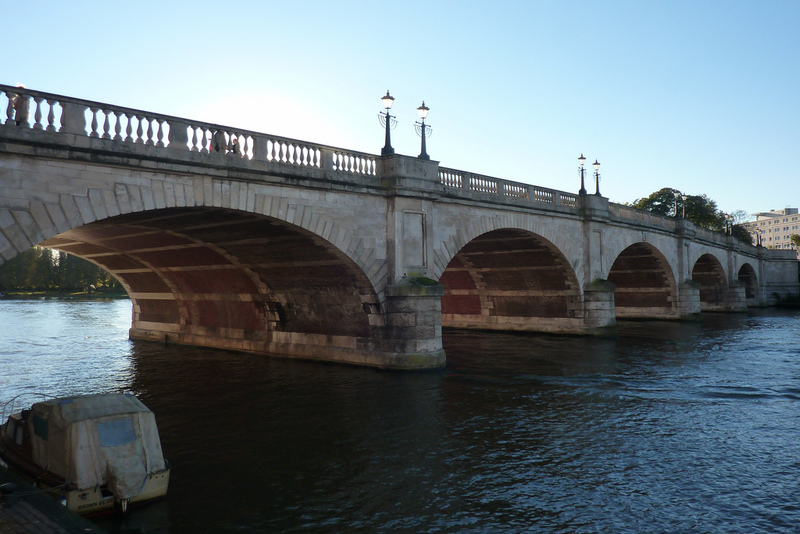 Despite the fact the Thames had given life to the place – reflected by the fact that the town’s formal name is Kingston Upon Thames – the town seems to have turned its back on the river. It’s tucked away, hidden from view by a giant branch of John Lewis. You could walk all the way round the town centre and never have a clue that the Thames was there. It seemed like a good omen if ever there was one, so we took our cue from the town’s burghers and headed away from the river for some lunch. In deference to Kingston’s water aversion we ended up eating in a branch of an Italian restaurant in the middle of a department store, with the only windows being those looking out on the women’s shoes department. 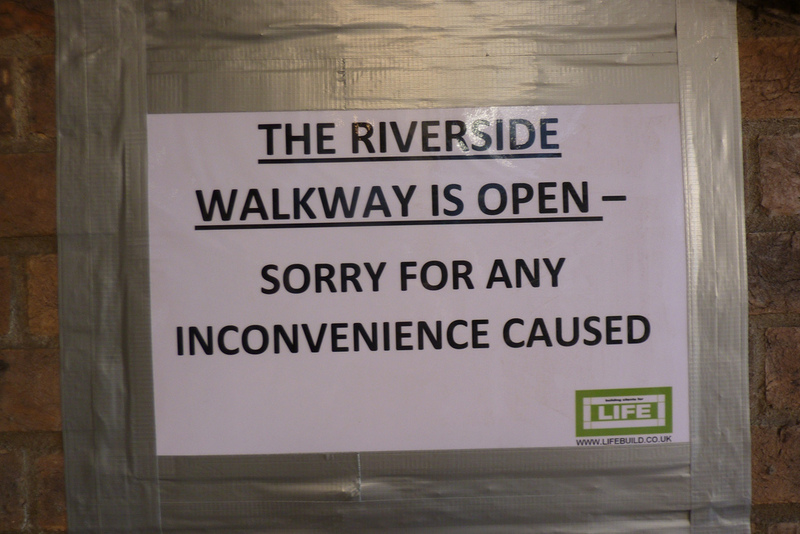 “The Riverside Walkway is open. Sorry for any inconvenience caused” proclaimed a white sign stuck to a subway wall with silver tape. It would have ranked as one of the strangest apologies ever, were we not in Kingston. Obviously the Riverside Walkway was an embarrassment to the locals. Better to stay inland, you’re safe there. We didn’t get to find out how bad the riverside was though. 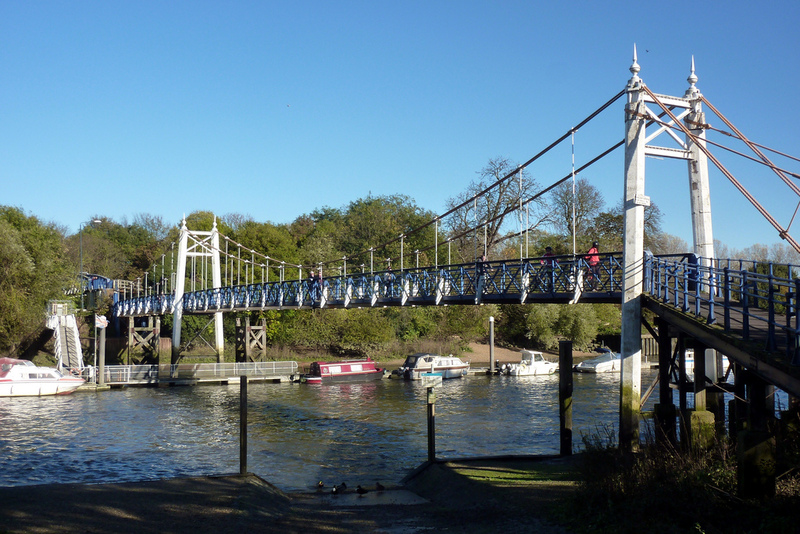 The Thames Path was about to switch banks, and a discreetly placed sign – almost hidden and very easy to miss – pointed us up on to Kingston Bridge to cross the water into nearby Hampton Wick, in the distinctly non royal borough of Richmond. The side of the river we were on may have changed, but the style of the path didn’t. The other bank in Kingston may have had pubs, restaurants and even a church with a gold cross blazing in the sun, but we had grass and trees. And, a short way out of Hampton Wick, there was a park as well. Hampton Court Park is a deer park, whose occupants descend from those introduced by Henry VIII. With a name like Hampton Court Park, you may expect it to be linked to the famous palace annexed by the aforementioned monarch, and you’d be right. Quite where the park’s alternative name of Home Park is derived from, I never did find out. The Thames Path stuck rigidly to the river outside the park, but I couldn’t resist peering through one of the nearby gates, at one of the 700 acres of land that the park covers. The deer seemed to be hiding, and all I could see was empty grassland, interspersed with trees. Not quite one of the last wild wildernesses, but as close as you’ll get to one in the London area. There were no rows of roses, or sculptured hedges, although I noted that it did rather inevitably house a golf course. Why was everyone suddenly French, I wondered. Were they all Royalists, exiled in London since the French Revolution, stubbornly clinging on to their old language? Who knew, although the fact is the French-speaking population of London is greater in number than that of most cities in France. Only Paris, Marseille, Lyon, Toulouse and Nice have more people of that Gallic persuasion. And clearly those that were here all loved to descend on the Thames near Hampton Court. “Promenading!” I suddenly exclaimed, to Catherine’s instant confusion. But that’s what it felt like. Everyone was out taking a leisurely stroll in their Sunday finest to see and be seen. Whilst there weren’t any women carrying parasols whilst wearing wearing large Victorian dresses with elaborate bustles, the number of people who were – like us – wandering around in hiking boots and mud splattered trousers was noticeably low. 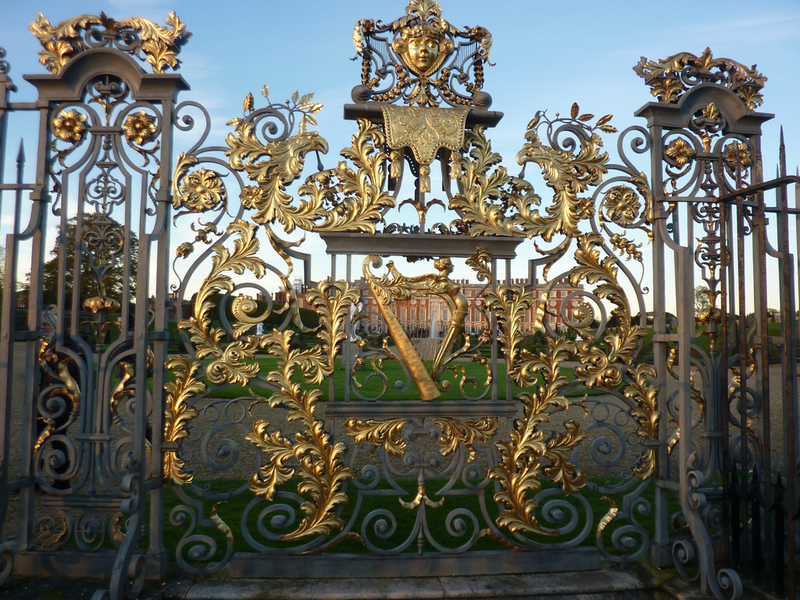 Doing our best, and failing, to look highly stylish amongst the French people, we arrived outside Hampton Court Palace; a pair of golden gates keeping us out of the Palace’s formal gardens. Originally built for Cardinal Thomas Wolsey in 1514, the Cardinal rose to be one of the most powerful people in the land, reflected by his impressive palace, which was extended several times. But his star was soon waning, thanks in part to his failure to obtain an annulment of Henry VIII’s marriage to Catherine of Aragon. In an attempt to gain a little favour, Wolsey gifted Hampton Court Palace to Henry in 1528, which was extremely convenient as a certain monarch had been looking for a replacement for the Palace of Westminster. Not that it did Wolsey any good. By 1529 he’d been stripped of his government position and of his property. He died the following year. 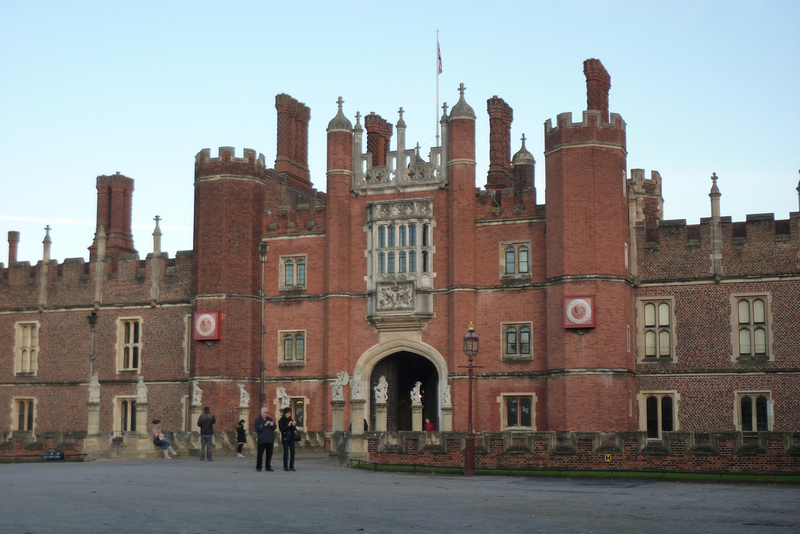 Under Henry VIII’s ownership, Hampton Court Palace was extended dramatically. The kitchens were quadrupled in size, a great hall and tennis court added, along with a host of other changes which would allow the Palace to host the entire court. Changes continued under successive monarchs until the 18th century. George II was the last king to reside in the place, and in 1838 it was opened to the public. It’s remained on the tourist trail ever since; the imposing mixture of Stuart and Tudor buildings bringing visitors from miles around. Even on a November day, the formal gardens were busy and the famous maze – designed for William III of Orange – popular with the punters. We stopped for a moment to admire the grand entrance, before walking on to nearby Hampton Court Bridge. The Thames Path once again crossed the river, leaving London as it did. On the other side, a sign welcomed us to Surrey. Specifically that Surrey County Council welcomed us to Surrey, although the words “County” and “Council” were in such small letters that the sign appeared to rather prosaically say that “Surrey Welcomes You to Surrey”. It was all lost on Sam though. He’d been asleep for most of the afternoon, conveniently only waking as Catherine tried to surreptitiously eat a cupcake without him noticing. A breadstick was quickly procured from the depths of the rucksack as the train left the station and took us on our way home; the river twinkling and glistening as the sun began to hit the horizon. Next time: goodbye London, hello Surrey! I tripped over these essays (can’t think of a better word) whilst looking for something to do in Kew, as I’m about to spend a couple of days in the area for reasons you don’t need to know. So I started at No.5 and I’m now at Hampton Court with no end in sight. The fact I’ll never walk that distance is obvious as I only have a few hours to spare when I visit next week. What a lovely read! Sardonic but generous observations, descriptions that bring the path to life, enjoying your social comments especially about desirable housing opportunities and the upturned collar halfwits who I’ve convinced myself infest most of this corner of London (I’ve never been of course, I’m from Clitheroe). You’ve got a fan whoever you are. With best wishes to you, Catherine and Sam. First Published: 15 January 2014. Last Updated: 11 July 2016.